All Warwick Parc homes currently listed for sale in Colleyville as of 04/20/2019 are shown below. You can change the search criteria at any time by pressing the 'Change Search' button below. 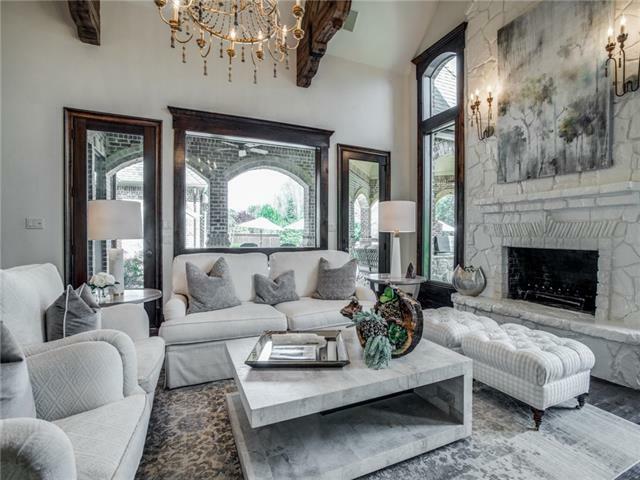 "Stunning custom home in the desired Warwick Parc of Colleyville that is meticulously maintain by original owners. Designed for comfort, entertainment,or a luxury resort lifestyle.This home is located on a lushly landscaped yard of nearly a half an acre with a outdoor living, kitchen, pool and spa.Luxury finish-out throughout the entire home to boast oversized en-suite bedrooms.Master and guestroom downstairs, 2 beds up with flex bedroom currently being used as gameroom upstairs w-bonus exercise"
"French Style Custom 4 bedroom, 4.5 bath, 4 living areas and 3 car garage. Outstanding floorplan & finish out. European detailed plaster crown molding, custom wall textures, & stunning artistic ceiling treatments. Floors feature wood, stone, tile, slate, travertine & carpet. Gourmet kitchen with granite, copper & limestone sinks, SSA's, Viking gas cooktop, dbl ovens & copper direct vent hood. Study with French doors & extensive built-ins. Gracious living area with wall of windows, fplace & custom"
"STUNNING EXECUTIVE ESTATE ON APPROX..5 ACRE! CORNER LOT SIDES TO PRIVATE NEIGHBORHOOD POND! This Mediterranean style home features 4 bdrms, 3.1 baths, a private study w-built-ins. Set apart for privacy, the maser suite offers a sitting area & luxurious bath retreat. Guest bed. down. The spacious family room boasts a floor-to-ceiling stone fireplace, built-ins & opens to the kitchen. Centrally located, a Chef's dream kitchen offers an island, a copper sink, breakfast bar, double ovens & walk-in"